Legends frequently take shape as communal responses to and reinterpretations of actual historical phenomena. 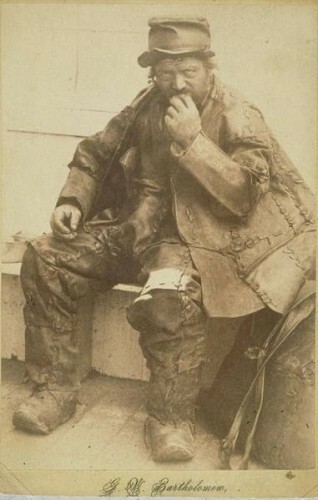 Among the more long-lived legends in Connecticut lore is the story of the Old Leatherman, whose first mysterious appearance in the state occurred before the Civil War and whose career as a familiar itinerant carried on until his death in 1889. The legend of the man has persevered well beyond the time of his recorded death. People continue to speculate about which caves are haunted by his ghost and where the money he is reputed to have stashed away might be buried. Little is known about who he was, how or why he came to Connecticut, or why he formed the habits that he did. Recorded accounts maintain that he seldom spoke to any of the many people he encountered over the years of his travels through Connecticut and New York. So, his story can be only patched together from their observations and interactions. 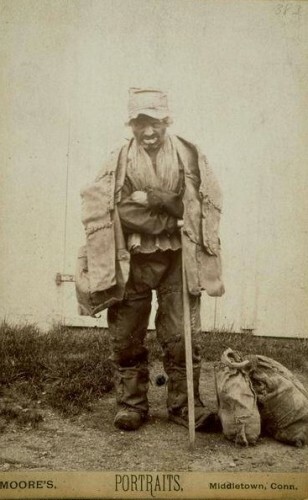 From his first appearance until the end of his life, the Leatherman devoted every day to walking a 365-mile, 34-day-long, clockwise trip through southwestern Connecticut and adjacent sections of lower New York State. The trips took him through Danbury, New Fairfield, Watertown, Middletown, and New Canaan, into Westchester, New York, back to Danbury and again to New Fairfield. Clad from head to toe in a stitched leather suit, which is clearly depicted in the several existing photographs of him, the Leatherman subsisted on the generosity of the region’s townspeople and farmers who came to know him. For all of the invitations he received to sleep in people’s houses and barns, he seems to have preferred caves and hollows. These tucked-away places, a few of which are named for him, are haunting reminders of his travels, and they keep his story alive in the landscape of Connecticut. The mysterious nature of his endless walking and his silence fueled speculation about his origins. The best-known story, and one that circulated in the press during his lifetime, is that he was Jules Bourglay, the disgraced suitor of the daughter of one of France’s foremost leather speculators. Having inadvertently brought about the financial ruin of the Laron family, Bourglay fled France, mysteriously surfaced in Connecticut (his first recorded appearance occurred in Harwinton in 1858) and embarked on his lifelong and wordless penance. This still-persistent tale has since been debunked. Besides walking through the entire year in every kind of weather, he devoted considerable time to the patching and general repair of his suit, which took on a new look with every piece he added to it. His food came from the townspeople he encountered along his way, who, once they were used to his presence and the unchanging nature of his schedule, made sure to provide food for him regularly. Those who made the mistake of being too curious about his identity learned that he would grunt in response to their queries and avoid return visits to their homes. On the other hand, locals who offered him what he needed on his own terms were rewarded by his regularly turning up and offering his silent appreciation. David E. Philips, the author of the book Legendary Connecticut, writes about a schoolgirl from Bristol whose teacher encouraged her pupils to work harder by offering them the chance to serve the Leatherman as a reward for their classroom efforts. All along the Old Leather Man’s route, people apparently sought opportunities to serve him. Only when he was hobbled by the combination of advanced cancer and a major snowfall in the winter of 1888, did he find himself powerless to resist people’s efforts to bring him indoors. Even then, a brief hospital stay succeeded only in setting him back a number of days in his rounds. The Old Leatherman lived another year and died as he was traveling through Mt. Pleasant, New York. Locals buried his remains in the pauper’s section of Sparta Cemetery in nearby Ossining, New York. In 2011, the town’s historical society petitioned to have the popular gravesite, which was located near a busy road, moved to a safer location within the cemetery. Researchers hoped that the exhumation might provide clues about the Old Leatherman’s identity. Alas, nothing remained save for a few coffin nails. 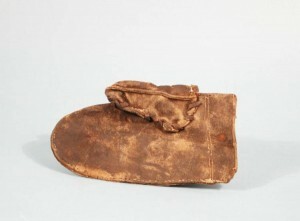 These, along with soil from the original site, were reinterred and a simple stone marker erected. In keeping with the mystery that still envelops this enigmatic figure, it reads simply: The Leatherman. Michael Hoberman teaches American literature and folklore at Fitchburg State University in Massachusetts and is the author of three books on New England history and culture, including, most recently, New Israel/New England: Jews and Puritans in Early America (University of Massachusetts Press, 2011). International Television Association, and Connecticut Humanities Council. The Road Between Heaven and Hell the Last Circuits of the Leatherman. Hartford, CT: ITVA/CT, 1984. Link. “The Hamden Historical Society Library and History Room.” Hamden Historical Society, 2015. Link. “Digital Collection: Leatherman - Artifacts and Portraits.” Connecticut Historical Society - eMuseum, 2016. Link. Philips, David E. “The Old Leatherman.” In Legendary Connecticut. Willimantic, CT: Curbstone Press, 1992. Search for Clues Only Deepens “Old Leatherman” Mystery. Morning Edition, 2012. NPR.org. Link.